I travel to Europe at least once a year, and this year, after my visit in Austria, I joined my brother and sister-in-law on a four-day trip to Italy, more specifically the South Tyrol region in northern Italy. The drive to Bolzano was going to be about five and a half hours long and during our drive through the scenic mountains of Austria I already started snapping pictures out of the car. These images are from East Tyrol, near the city of Lienz. About three hours into our drive we crossed the border from Austria into Italy near the town of San Candido, which is called Innichen in German. The surrounding region of South Tyrol used to be part of Austria until 1918 and about 85% of the local population still speak German as their first language. The surrounding mountain range of the Dolomites provides an incredibly photogenic backdrop. After the town of San Candido / Innichen, we turned south onto Highway SS51 that leads towards Cortina d’Ampezzo, Italy’s most famous ski resort. One of the most impressive sights in this area are the Tre Cime di Lavaredo, the “Three Peaks of Lavaredo”, which are three distinctive battlement-like peaks that are part of the Sexten Dolomites of northeastern Italy. These mountain peaks are very iconic and they are located right at the linguistic border between the German and Italian-speaking regions of Italy. The highest of the three peaks, the Cima Grande, has an altitude of 2,999 metres (9,839 feet). 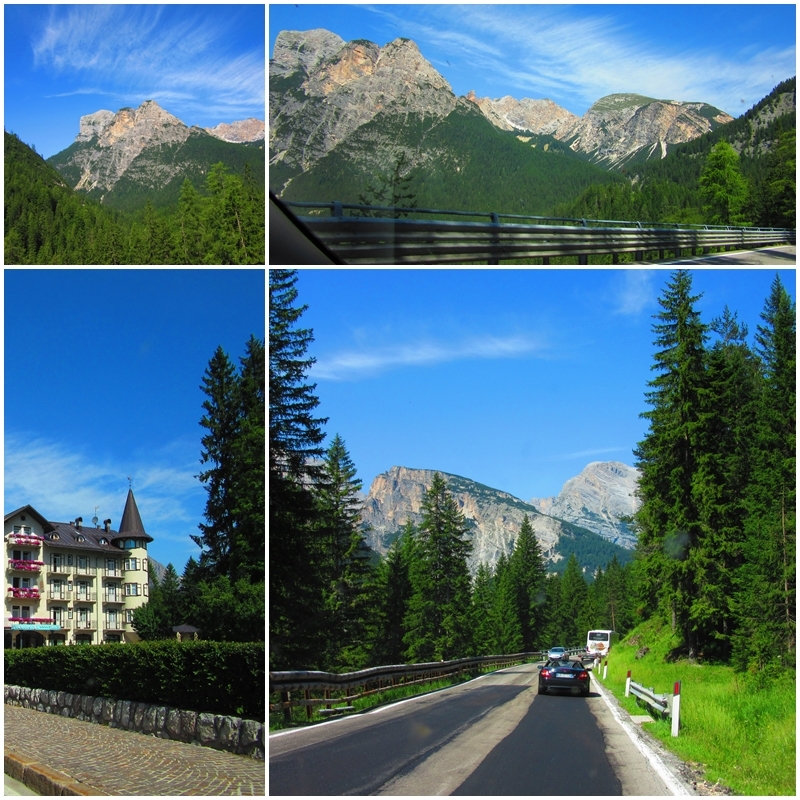 As we were driving toward Cortina d’Ampezzo, I continued my photo shoots out the car window. These images were taken near Fiames, a small village not far outside Cortina, in Italy’s Veneto region. Fiames is located along the banks of the Boite River and at the foot of the Pomagagnon and Tofane mountain massifs. These lovely buildings are located just outside of Cortina d’Ampezzo, a popular mountain resort in Italy’s Veneto region. This is Italy’s most well-known, fashionable and expensive ski resort. In the summer you can play golf here, and there is also an outdoor adventure park. Cortina d’Ampezzo hosted the 1956 Winter Olympics and has also been depicted in movies such as The Pink Panther, For Your Eyes Only and Cliffhanger. From here we continued our drive towards Bolzano through some of the most dramatic landscapes of Italy.